Spiderwort (Tradescantia x andersoniana): growing, planting, caring. A low-maintenance perennial, grown for its showy flowers and attractive foliage. Full description for Tradescantia x andersoniana not yet available. 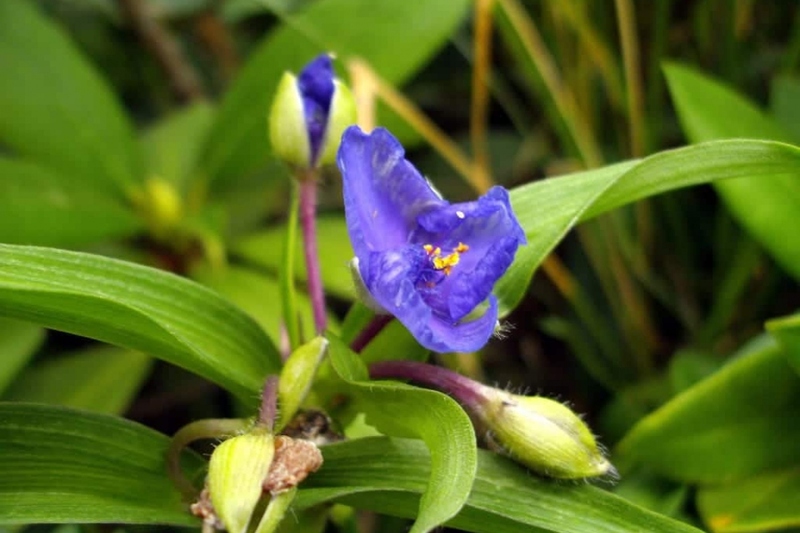 Spiderwort is recognized by its long, gnarled stem, and its long narrow leaves and 3-petalled flowers. Flowers are mostly violet, blue, sometimes pinkish white, red or pink. Tradescantias need fresh, moist, well-drained soil: add sand if needed. Dip the clumps in a tray filled with water to moisten them well. Plant them when the water is no longer flowing out of the bucket. Prepare the soil: make holes, leaving a spacing of 20 to 30 cm per foot, and mix the soil with potting soil, sand and some compost. Place the plants in there. Cover with soil by tamping gently to avoid air around the roots, then water. The spiderwort needs water, especially in case of hot weather. In pots, keep the soil moist by regular watering. In the open soil, it is more difficult to say, it depends on your mulching, the situation ... Anyway, monitor your plant, the state of its leaves, its bloom, should inform you. Push a finger into the ground, it must be cool! Mulch the spiderwort abundantly, it will spare you some watering and weeding in summer, and - even if they are rather hardy: it will protect the roots of the cold in winter. You can, from the middle of spring, use grass clippings, for example!